The latex free, Coloplast Self-Cath Plus Hydrophilic Catheter is designed for single use, intermittent self-catheterization. The unique hydrophilic coating activates immediately upon exposure to water for fast, clean lubrication and maximum ease of use. 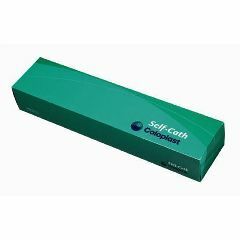 To facilitate catheterization, the Self-Cath Plus offers an uncoated GripZone area. The Self-Cath Plus is flexible, has smooth fire polished eyelets and is made of medical grade PVC. Locate urethra and gently insert the catheter until urine begins to flow. When urine stops, slowly begin to withdraw catheter until flow ceases. Dispose of catheter. Product is designed for single use only. Intermittent daily cath. Neurogenic bladder. Easy to use, no messy lubricants, easy to store! It's the only catheter I will use. Product is used throughout the day as needed. Is convenient,but expensive. Travel - away from home.